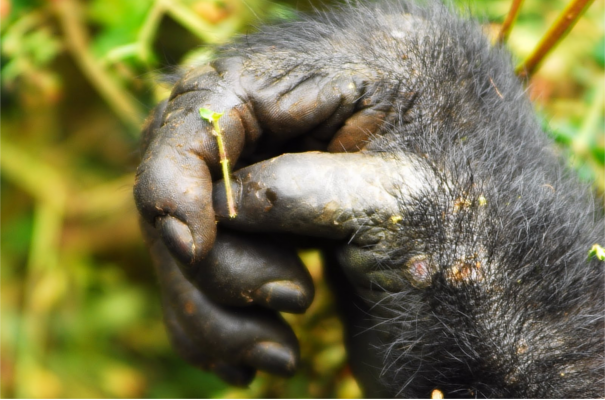 The great, old volcanoes shared between Uganda, DRC and Rwanda form the northwest border of Rwanda, and have created a lush home for the mountain gorilla, one of the main reasons for visiting the country. The steep slopes are covered with rich bamboo forests, and evergreen glades with open grassland and heath. The slopes are perfect terrain for the gentle giants of the primate world, gorillas. The park is small, covering just 120 km² and includes the peaks of Karisimbi (4,507m), Visoke (3,711m), Sabyinyo (3,534m). Views on the slopes of the Virunga volcanoes are magnificent in all directions, although one needs to dress warmly as it can be quite chilly on these lofty heights! Habituated golden monkeys live in the same forests and this is one of the few places they can be seen for relatively long periods at a time. Buffalo and elephant do inhabit the area but are not easily seen. Rwanda Gorilla treks are run on a daily basis from the park headquarters although there is a limited amount of permits available and these need to be booked well in advance. The park is well run by the Rwandan park authorities and the gorilla conservation fund is well supported. Around 380 mountain gorillas live on the slopes although the population changes as these animals know no borders and range freely between the DRC, Uganda and Rwanda. Diane Fossey's memorial, laboratory and grave are nearby with a full history of her life and works with the gorillas. Although the park can be visited for the day from Kigali, it is a long drive along curving, scenic roads and most visitors are advised to stay in one of the many lodges and hostels which have been built around the park and Ruhengeri. The town of Ruhengeri is a busy market centre with traders coming from far and wide and boda boda's transporting shoppers here and there. The stunning lakes of Buhera, Ruhondo and Karago are near to the Park but are rarely visited.